We keep a waiting list. The best way to get the puppy you want is to get on our waiting list. Normally all our puppies will be chosen from a litter from people that are on our list so we do not post puppies for sale on our website. Deposits to hold a puppy are $500.00. Payments are by bank wire from your bank to mine. Bank wires clear the same day and are traceable should there be a problem. Bank wires go through the federal reserve and are very safe. Final payment is required within 2 business days once a puppy is chosen. Failure to pay the remaining balance within this timeline will result in the puppy being sold to someone else and the deposit will be forfeited. FYI scammers ask for payment via western union or money gram. This is not traceable. Scammers do not have bank accounts. Think about all the information a bank requires to open an account. A scammer would be shut down pretty fast. If you have reservations about wiring money to our bank account, we advise you to purchase a puppy locally to you. 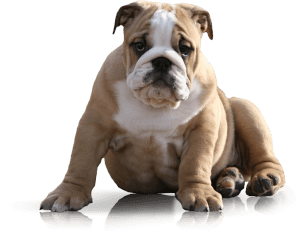 We have raised Bulldogs for 40 years and been online over 20 years. We are here to help people purchase a healthy, beautiful puppy. Our passion is raising Bulldogs not scamming people. No Refunds on deposits or payments except under special circumstances. Please be certain you wish to purchase a puppy from us before placing a deposit. The best way to get the puppy you want is to get on our waiting list. We want to help you get your puppy no matter how far away you live. Buyers are welcome to fly to our nearest airport we will meet you there and your pup can fly home with you. Pups are allowed to be carried on the plane. You can also use our courier services and your puppy will be personally escorted on the flight to your nearest airport or to your home for an extra fee paid to the courier. FYI to help you understand more of what a correct Bulldog should look like. Description from the official Bulldog standard regarding eyes, color of coat and nose. Eyes very dark, Nose Black. 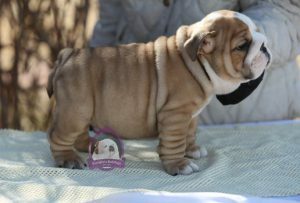 There are no rare colors in pure bred Bulldogs. Paying more for a non standard color you are paying more for a dog that is not purebred and can never be shown. Quality is determined by how close a dog conforms to standard. If these colors are disqualified what does this tell you? 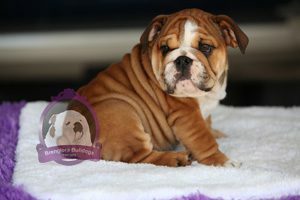 If they were desirable in the Bulldogs standard we would be breeding them. 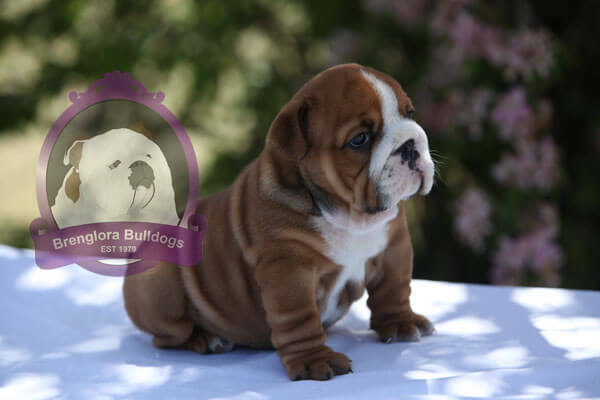 Reputable breeders only breed for the Bulldog standard. So called rare colors are all about money. Fawn and fallow are red, or lighter color. Eyes and Eyelids — The eyes, seen from the front, should be situated low down in the skull, as far from the ears as possible, and their corners should be in a straight line at right angles with the stop. They should be quite in front of the head, as wide apart as possible, provided their outer corners are within the outline of the cheeks when viewed from the front. They should be quite round in form, of moderate size, neither sunken nor bulging, and in color should be very dark. The color of coat is explained below. Bulldogs are not supposed to be Blue, tri colored, or merle. Or any other color except as explained below. Color of Coat: The color of coat should be uniform, pure of its kind and brilliant. Colors are red, white, fawn, fallow, or any combination of the foregoing. Patterns and markings may include brindle, piebald, ticking, black masks, black tipping, and a minimal amount of black in piebalds. All other colors or markings are a disqualification. The merle pattern is a disqualification. Also disqualification: Brown or Liver Colored nose. Bulldog puppies are born with pink noses. The noses gradually turn black. If the pups has a brown or liver colored nose this is a disqualification in the standard. Contact us with any questions or if you would like to reserve a puppy. 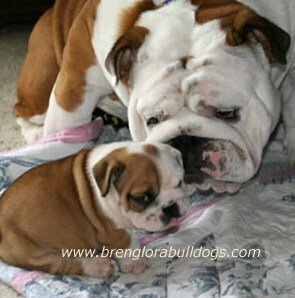 We are always happy to talk about our Bulldog puppies. Copyright©2017 Brenglora Bulldogs. All rights reserved.